It's true, I'm not blogging much at the moment. I hear you. I am still using the Thermomix almost every day, but doing things in it that you've already heard about, I don't wish to bore you. I'm crocheting a hat. I'm going to renovate the house and have a spot of ankle surgery, so those things should keep you amused. What I am doing at the moment is a bit of study, little light teaching and trying unsuccessfully not to get onto even more committees. These things involve quite a lot of reading and writing, and since I'm a modern girl who got an iPad mini for her birthday and a stylus for Mothers Day, it's all paper free. I thought I'd share with you my thoughts on getting this to work. 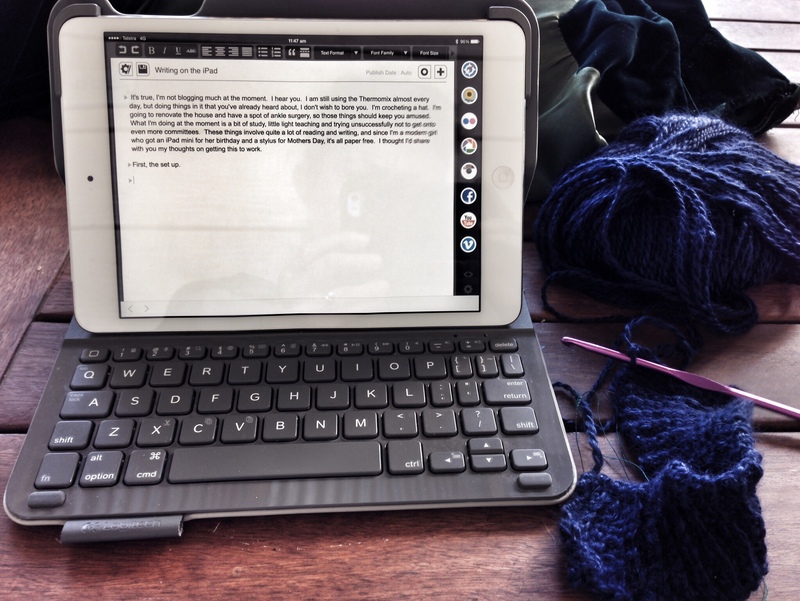 iPad mini with Logitech bluetooth keyboard folio. Closed it's about the size of a slim paperback. I'm using it ALL THE TIME. I can touch type on the keyboard. Note, to do this you must first be able to touch type, I have the advantage that I was a teenager when your typing speed was something you still put on your resumé, so thank you Mavis Beacon on giant floppy disk. Email, recipes (Paprika), calendar (synched with the husband's), weather (not that it's even slightly interesting at the moment, piss off high pressure system and your unrelenting pleasantness), Twitter, reading books, Facebook, Slate. Because it's such a cute piece of kit I am trying to use it for everything, so recently I've been experimenting with using it for minute taking (you can't always trust the committee secretary not to be in Hong Kong), shopping lists, keeping photos of documents that I would traditionally lose, photos of recipes and craft patterns, jotting down observations for the blog, drafting essays and reading my uni notes. And loving it! 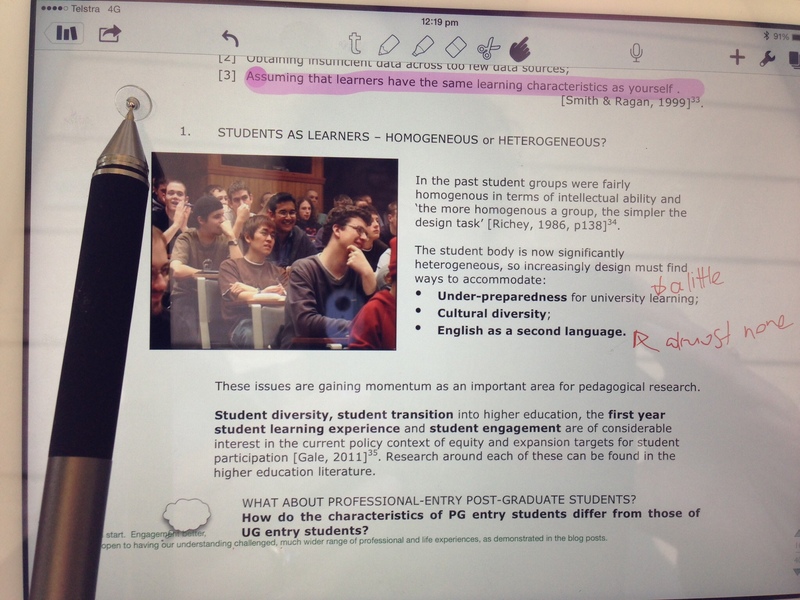 The two apps that I've found to be extremely terrific are Evernote and Notability. Both have their strengths and weaknesses. I'll tell you about Evernote first. I use Evernote for an increasing number of jobs. You set up a notebook, they can't go calling it a folder because, you know, brand, and place notes inside it. I have notebooks such as craft patterns (you can photograph straight into the note if you see something pleasing in the elderly Family Circle magazines at the doctor's), shopping lists (it does checklists that you can satisfyingly check off), receipts and warranties, a notebook for each committee I'm on. You can set task reminders that will pop up on your home screen. If you've installed it on your phone, you can enter your shopping list on your iPad, and have it on your phone when you're at the shops. You can cut and paste from it and email from it, yes you can have the minutes, I'll email them to you immediately. It's easy to use and I'm using it more all the time. You can add tags, links, audio notes, photos and reminders. Evernote and my calendar are becoming my external memory, handy, as the internal one is showing signs of wear. I think it's full. I'm new to Notability. I'm also new to university study, haven't had to read academic papers for nearly twenty years. I don't know about you, but I like to read a paper with pen in hand. And this is what Notability is for. The pen is a very nifty stylus from Jotpro and handles just like a pen. You can see that you can type, write and highlight on the paper. I've found that to write legibly I have to expand the screen and write in big letters, but that works for me. Apparently you can just handwrite notes too, it has a wrist rest section, but I have a keyboard and can touch type, so whatever. You can then save the paper back over itself onto Dropbox. You could even print it out, but I haven't felt the need. Notability also has folders, but they're called subjects. Could we get some standards here? I can't find any tagging capability either, but search works OK and I haven't got that much paperwork. I've loaded up all of my study modules and it's very easy to flick between them. When it comes to actually writing the essay I usually write it on the PC so I can have the notes in front of me on the iPad. You can, in theory, use a stylus in Evernote, but man it's clunky. They've got a separate stylus enabled app called Penultimate which can do most of the things Notability can do, only with a fancy leatherbound notebook type interface. BUT it's horrible. The first thing that made me delete it was that it DOESN'T DO LANDSCAPE!!! I haven't clicked this iPad out of the folio since I got it months ago, and I'm certainly not going to do it just so I can use Penultimate without getting a crick in my neck. Secondly it hasn't got the range of pen widths that Notability does, I like my writing fine and Notability also adds a slight pen pressure effect which is very pleasing. So try again, Penultimate. The ultimate effect of these two apps on my iPad mini is that I can work anywhere and whenever I encounter a laptop I tend to poke it in the screen. I also haven't had to print out anything other than school notes and choir attendance sheets in months. I love living in the future.